Not surprisingly, after five short days of “intense” debate, the PAP-dominated Parliament passed an amended motion to endorse the Population White Paper yesterday (8 Feb). The White Paper was drafted by the National Population And Talent Division (NPTD) under the Prime Minister’s Office. PAP has relied on its overwhelming majority in Parliament to bulldoze the White Paper through Parliament. PAP MP Liang Eng Hwa had proposed amendments to the original motion. His proposed amendments, which were passed, include explicitly stating that the White Paper “supports maintaining a strong Singaporean core by encouraging more Singaporeans to get married and have children, supplemented by a calibrated pace of immigration to prevent the citizen population from shrinking”. However the term “Singaporean core” was not defined in the motion. WP MP Low Thia Khiang specifically called for division on the amended motion. That is, the vote of each Member is collected and tabulated through an electronic voting system. 7 elected opposition MPs: Low Thia Khiang, Sylvia Lim, Pritam Singh, Chen Show Mao, Muhamad Faisal, Png Eng Huat, Lee Li Lian. 3 opposition NCMPs: Yee Jenn Jong, Gerald Giam, Lina Chiam. 3 NMPs: Faizah Jamal, Janice Koh, Laurence Lien. All the PAP MPs present endorsed the White Paper. MP Interjit Singh who spoke out against the White Paper was not present at the voting. She said that her party “believes that the path proposed by the White Paper will further dilute the Singaporean core and weaken our national identity” and lead Singapore to “require unsustainable population injections in the future”. Ms Lim added that the party believes that the greater well-being of Singaporeans “lies in sustainable economic growth driven by increases in our productivity and in our resident workforce, rather than further increases in our dependency on imported foreign labour”. She said the focus should be on increasing the nation’s total fertility rate and growing the resident labour force participation rate rather than on importing foreign labour. 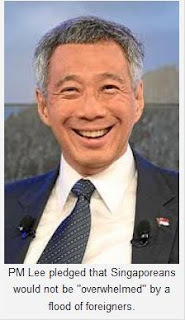 PM Lee pledged that Singaporeans would not be “overwhelmed” by foreigners, not realizing that at the current population size of 5.3 million people, many Singaporeans are already feeling overwhelmed. PM Lee claimed that the interest of Singaporeans lies at the centre of all the government’s plans, and that economic growth and population policies are just a means to ultimately improving citizens’ well-being. PM Lee said that the conversation on population will continue, even after the endorsement of the White Paper. It is not known what the conversation hopes to achieve further given that the White Paper has already been endorsed by Parliament. However, despite the negative sentiments on the ground towards the White Paper, PM Lee brought a bulldozer to the National CONversation and managed to “persuade people to see things more in the way” that he wanted it to be seen.